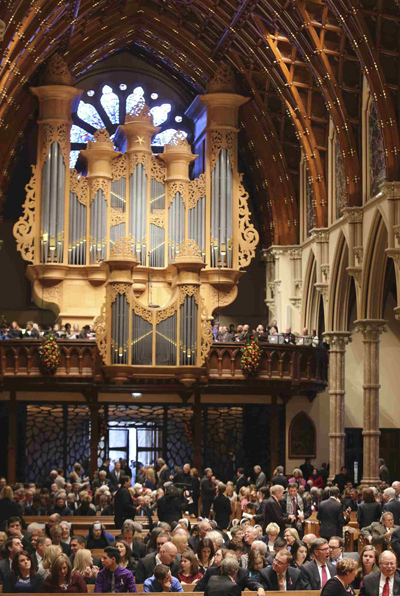 Before an overflow crowd, the archbishop said he had “a bit of a panic attack” when he saw the day’s Gospel reading was about Jesus walking on water and calling his disciples to follow him. 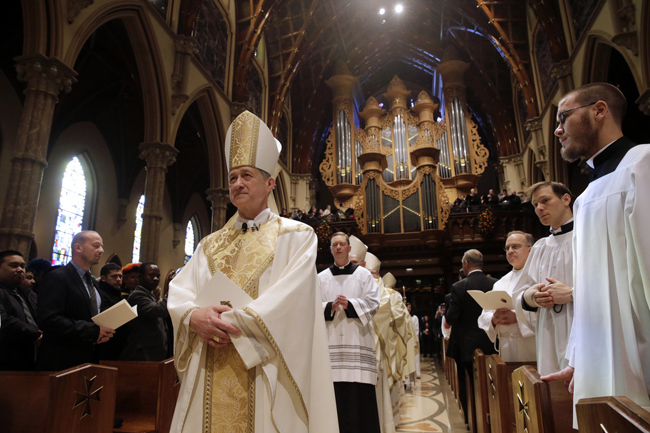 During the Mass at Holy Name Cathedral, the Archdiocese of Chicago welcomed its ninth archbishop with several outpourings of applause and gratitude for Archbishop Cupich and his predecessor, Cardinal Francis E. George. After Cardinal George began the Mass, Archbishop Carlo Maria Vigano, apostolic nuncio to the United States, read the apostolic mandate from Pope Francis appointing Archbishop Cupich to Chicago and he formally accepted. Archbishop Cupich chose the date for his installation because it is the commemoration of the dedication of the Basilicas of SS. Peter and Paul in Rome. He grew up in SS. Peter and Paul Parish in Omaha, Nebraska, the parish that his grandparents helped to found. During his homily, the archbishop explained that all four of his grandparents were immigrants from Croatia, and the date was meant to recognize immigrants. It’s also the feast of St. Rose Philippine Duchesne, who ministered to native people, so the date recognizes both Native Americans and the contributions of religious sisters, he said. To do that authentically, Christians must reach back to their own baptismal calling, he said. That’s what bishops must do as they continue to work in the aftermath of the sexual abuse crisis. “Working together to protect children to bring healing to victim survivors and to rebuild the trust that has been shattered in our communities by our mishandling is our sacred duty, as is holding each other accountable, for that is what we pledge to do,” he said. Jesus does more than seek out his apostles in that Gospel passage, Archbishop Cupich said. He also invites Peter to join him on the water. “Jesus invites us, not only to take the risk of leaving our comfort zone, but also to deal with the tension involved in change … and to challenge each other to do so,” he said. “His coming to us, his communion with us is not for the perfect, but is for the salvation of souls, for the lost, the forlorn and those who are adrift,” the archbishop said. “That is why now, in our day, Peter, in his successor, Pope Francis, urges us to take up the task of crossing the seas to seek out, to invite and accompany others, because the risen Christ is in the boat with us,” he concluded. Archbishop Cupich’s homily was heard by a congregation that included seven cardinals and about 95 archbishops and bishops as well as hundreds of priests. It also was broadcast live on all Chicago news stations, the Eternal Word Television Network and Relevant Radio. All eight of the archbishop’s siblings attended the installation. They, and their children and grandchildren, made for a family group of about 55 people, most of whom came to Chicago Nov. 17 and got to spend some time sightseeing before that evening’s rite of reception for the new archbishop at the cathedral. One evening, the family had dinner at the cardinal’s residence cooked by the Polish women religious who take care of the residence, according to Margaret Altman, Archbishop Cupich’s sister. “It was a lovely Polish meal,” she told the Catholic New World, Chicago’s archdiocesan newspaper. They also took time for Chicago-style pizza and shopping, and the men in the family saw the Chicago Bears beat the Minnesota Vikings at Soldier Field Nov. 16. Many family members had attended Archbishop Cupich’s ordination as a bishop in Rapid City, South Dakota, in 1998, and his installation as bishop of Spokane, Washington, in 2010, but the scale of the events in Chicago was quite a bit bigger, said Kathy Schulte, Archbishop Cupich’s sister. Among those who attended from the Diocese of Rapid City was Margaret Simonson, the chancellor, who said Chicago is fortunate to have Archbishop Cupich. I will miss Cardinal George and his leadership on the issues of the day. Best wishes for Archbishop Cupich in his new assignment.